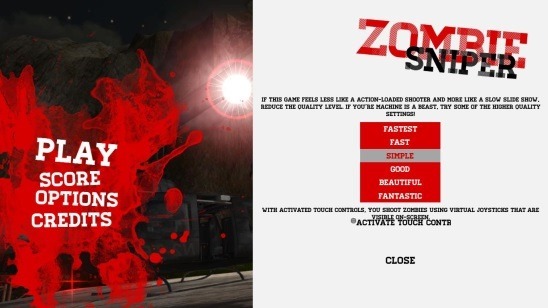 Awesome Zombie Sniper is a free first person shooting game app for Windows 8. The objective of the game is to kill all the hungry zombies, who wants to eat you up. Using an arsenal of weapons you can kill the zombies and hence survive. The ammo (bullets) and med packs (medicines) will help you in surviving. Killing zombies will award you with achievements and credits. You can use the earned credits to get new weapons. This free shooting game app also works on other Windows 8 devices like Windows 8 phones and tablets. 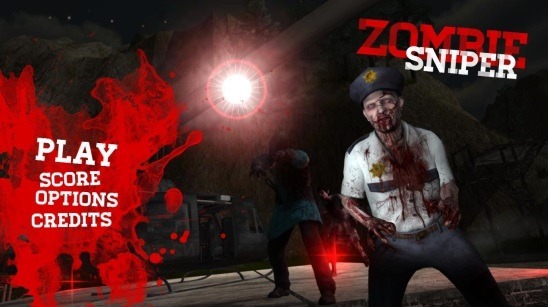 Zombie Sniper is a good shooting game app and all the junkies who are big fan of zombies and like to imagine themselves in a zombie infested world, should definitely try their hands on this free Zombie killing game app for Windows 8. You can get this free Windows 8 shooting game app under the Games Category in Windows Store. If you have played Call Of Duty, BioShock, Doom, or Halo, then you’ll definitely love this free Windows 8 game app. The app has one simple concept. You’ll be dropped in the middle of a dark and spooky forest, with a hostile environment and a dark background theme. The graphics, sound, and not to forget the blood soaked zombies add a lot to the horror element of the game. You’ll get an old rusted bridge and two houses (which are about to collapse) at both ends of the bridge. You have to be careful with the houses, because these are the places from where the zombies come out. This is all the location consists of, and you’ll be playing within this much area only. This is one good thing about this free shooting game app, since there’ll be no point in the game where you’ll get lost in the middle of nowhere; and hence makes the game simple and straight. The game is played in terms of waves (stages), and in each of the wave you’ll be given a target. The target is to kill certain number of zombies. Killing zombies get you awarded with credits and achievements. Some of the achievements includes: 400 kills in one game, 3000 total kills, the first kill etc. The achievements might sound crazy, because at an average I could kill 50 zombies, but they were still achievable. All you have to do is keep playing. There are ammo boxes and med packs dispersed here and there. Use them well to achieve your goal. 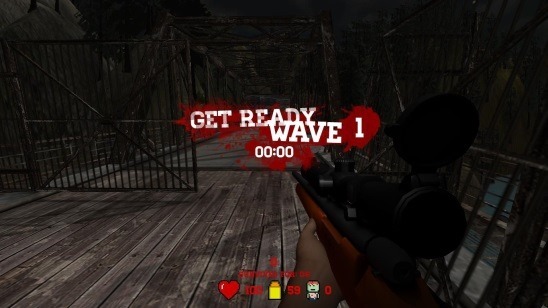 One good way is to first kill all the zombies in a wave leaving one or two behind, so as to clear the area. Until and unless all the zombies of a wave are not killed, the next wave of zombies won’t come. So you’ll get the whole area almost clean. Now you can go to the other side of the bridge where there are no zombies. This makes grabbing the med kits and ammo boxes easy. All the zombies walk in a zigzag pattern. Use W, S, A, and D keys to move in Up, Down, Left, and Right directions. Use mouse left and right clicks to Fire and Zoom. After firing a shot in a zoomed lens view, make a right click to reload the sniper. Otherwise it won’t get reloaded. Use flash light during the game play. Freely available 3D game app for Windows 8. Good First person shooting game to kill zombies. Game play starts with 100 life meter and 60 bullets by default, which is quite sufficient. Achievements and credits to unlock. Supports different graphics setting options for smooth game play. 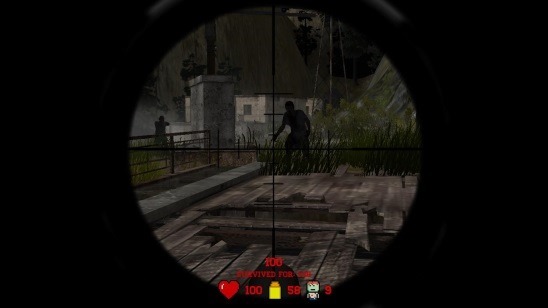 Awesome Zombie Sniper is a good first person shooting game app for Windows 8. It has got the chilling effects, definitely spooky. The gameplay is easy and straight. I didn’t meet a single instance where the game got freezed. It is functional and of moderate difficulty. The gameplay is pretty good. Although the credits didn’t get added to my account, but besides that everything worked fine. Definitely a must have Windows 8 game app for the game geeks. How do you save the game? So you don’t have to restart every time.